The Hydrofill® Pro system provides a "hydrogen on demand" desktop refueling station and automatic refueling of the Hydrostik Pro metal hydride cartridges. It offers a quiet, safe, and convenient hydrogen supply using deionized or distilled water. The technology uses a proton-exchange membrane (PEM) electrolyzer to charge Horizon&apos;s Hydrostik and Hydrostik Pro metal hydride cartridges automatically. It is compatible with solar or wind turbines (requires 25 W DC power input). 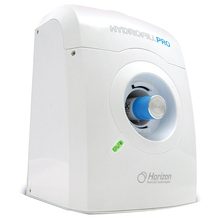 The Hydrofill® Pro recharges the Hydrostik Pro, included with the Horizon Energy Box (item #759260) and used in several experiments, for up to 11 Wh of electricity. Hydrogen fuel cells offer the potential for clean energy and much higher energy efficiency at 40–65% vs. 30–40% efficiency of fossil fuels. The Hydrofill® Pro provides a high-performance hydrogen station that is compatible with 2- to 30-W fuel cell power devices. The compact design is particularly suited for school science labs. Dimensions: 145 x 153 x 208 mm (5-7/10 x 6 x 8-1/5").